Dog fences offer a way to keep your pet safely contained on your property. Why Do We Need Dog Fences? If you live with dogs, then you may already have an idea just how valuable good dog fences can be. Dogs that are allowed to run freely through a neighborhood can be a nuisance and a danger to themselves and others. Lesser offenses can include getting into trash and harassing other neighborhood pets and residents, but circumstances can become even more serious than that. It only takes one dog in the road to cause an automobile accident. A single dog bite could result in having your dog removed from your possession and possibly euthanized. Additionally, many local ordinances prohibit dogs from running off-leash, and local animal control officers will pick up loose dogs, licensed or not. Far better to avoid potential problems altogether by installing good fencing. There are many types of fencing that can serve well for creating dog enclosures. Here are a few things to keep in mind when making your choice. The size of your dog is an important factor in choosing proper fencing. A large dog requires a higher, stronger fence for containment. The distance between the rails may not be a large concern as the dog is unlikely to fit through the opening. On the other hand, a small dog may not need quite the fence height, but the size of the openings in some fence styles becomes a major consideration if it is possible for your pet to slip partially or completely through. Your pet's temperament will also play a part in your selection. Some fencing requires certain training techniques to use effectively. Some dogs may also require more privacy to be safe and content in their designated area. Are you just concerned with keeping your pet in, or keeping other pets and people out as well? Many dog fences will keep your pet in the yard but still allow it to be seen, and possibly reached by other animals and people. 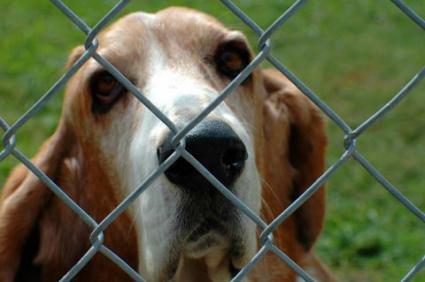 Wire fencing with a mesh of two by four inches is sometimes used as dog fencing. Split rail fencing is attractive, but the large openings will not keep dogs from escaping. You can dog proof it by attaching the wire fencing to the inside of the rails to cover the openings. Now the fence is serviceable, but still looks good. Chain link is sturdy and durable, but not particularly attractive. If you desire a nicer look, and a bit more privacy, you can purchase colored plastic stripping from a fencing supply store to weave through the holes. Picket is strong and attractive, but spacing between pickets can be an issue. You can remedy large spacing by opting to install individual pickets to the rails yourself, instead of purchasing pre-fabricated sections of fence. Privacy fence comes in various heights, from four to eight feet high, and has little to no spacing between the slats. You also have the choice of wood or vinyl construction. Be sure there are no gaps between the bottom of the fence, and the ground that would allow your dog room to escape. Bury the lowest part of your fencing below ground level during installation to discourage digging. Check your local zoning ordinances regarding fencing regulations and construction permits before installation begins. An electric fence, also known as invisible fencing, is quite different from conventional fencing. It's used to keep your dog in the yard, but it doesn't keep anyone, or anything else out. Here's how it works. Electric fencing consists of two main components; a wire cable, and an electronic collar for your dog to wear. The wire cable is buried underground around the perimeter of the area you want your dog to stay in. This cable is hooked up to your electricity, enabling it to transmit a signal to the electronic collar being worn by your pet. When your pet approaches too closely to the perimeter of the yard, the cable will transmit a signal to the collar, which in turn will give your dog an unpleasant shock stimulation to drive him back from the perimeter. To use this fencing effectively, you will need to spend some time working with your pet to make sure it associates the shock with the perimeter. To do this, walk your dog around the yard on a leash while he's wearing the collar, repeatedly approaching the cabled perimeter. You'll need to walk your dog near the entire perimeter enough for him to learn just how far he can comfortably go. To test your dog, let it off leash in your presence, and walk over the perimeter yourself. When your dog refuses to follow you over the perimeter, you'll know he has learned the limits. You can use the collar as needed to reinforce the training. Please note that some dogs may still go over the perimeter whether they are wearing the electronic collar or not. Once a dog wearing the collar reaches the other side, he will still receive the same shock stimulus when he approaches the perimeter again, making it difficult for him to return. Additionally, dog shock collars are not an appropriate training tool for pets with fear and previous abuse issues, and could cause harm if used, so keep this in mind when considering if an electric, invisible fence is the right choice for your pet. As you can see, there are many ways to fence in your yard, and each style offers a different level of containment and privacy. Consider your pet's individual needs and temperament, as well as your local city ordinances to determine which style of fencing is the right choice for your situation.